Diamonds in the sky could really exist if scientists are right that planets made of up to 50 percent diamond are possible. Some alien planets could be packing some major bling, according to a new study that predicts planets around other stars could be made largely of diamond. But while such a place might sound beautiful, you wouldn't want to visit, scientists say. A diamond planet would very likely be devoid of life and incapable of supporting living beings like us. "We think a diamond planet must be a very cold, dark place," Ohio State University Earth scientist Wendy Panero, leader of the study, said in a statement. 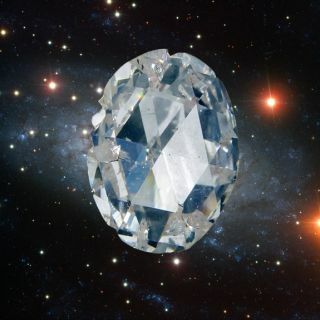 Diamonds are very good at transferring heat, so a carbon super-Earth's interior would quickly freeze as all its heat escaped. Without strong heat in its core, like Earth has, a diamond planet would have no geothermal energy, which means it would lack plate tectonics, a magnetic field and an atmosphere — all things thought to make Earth so hospitable to life. Panero and her colleagues recreated the temperatures and pressures of Earth's lower-middle layer, called its mantle, to study how diamonds form there. They used these results to build computer models simulating how minerals could form in alien planets with more carbon than our own. "It's possible for planets that are as big as fifteen times the mass of the Earth to be half made of diamond," said Cayman Unterborn, a graduate student at Ohio State University. If the idea sounds completely foreign, it's actually not. Geologists have long suspected that Earth's lower mantle, just above its core, contains a diamond-rich layer. However, alien planets that contain more carbon than Earth could have much more diamond content than here at home. "Our results are striking, in that they suggest carbon-rich planets can form with a core and a mantle, just as Earth did," Panero said. "However, the cores would likely be very carbon-rich – much like steel – and the mantle would also be dominated by carbon, much in the form of diamond." Unterborn will present the team's findings Tuesday (Dec. 6) at the American Geophysical Union meeting in San Francisco.